You are here: Home / Culture / Is Greenville The Best Place To Live In South Carolina? For a long time, it seemed as if Boulder, Colorado was the place where we should be all living. All the country’s major newspapers and travel and food magazines touted the Rocky Mountain haven as the most progressive town in the country. There is, of course, no point arguing the fact that Boulder, thanks to the University of Colorado has a young, vibrant, feel to the place and with Eldora Mountain Ski Resort on your doorstep and Vail and Breckenridge just a short drive away it makes a great home for winter sports enthusiasts. Meanwhile, Greenville, South Carolina has quietly been going about its business while not bragging about what a great town it is and why you should live there. Greenville preferred word of mouth to do the job, allowing the Blue Ridge Mountain Beauty to grow at its own leisurely pace. Located in the upstate region of South Carolina, a short four-hour drive from Myrtle Beach, Greenville is an outdoor playground full of beauty and wonders that will never cease to delight. With over 220 days of sunshine and a temperate climate without extremes, Grenville ticks all the boxes when it comes to finding your ideal place to live. Looking back natives will tell you that as the textile industry started to struggle during the 1970’s so did the town. Many shops on Main Street began boarding up as businesses that had been there for generations started to fail. The turning point it appears was the arrival of the German automobile manufacturer BMW in 1994 and its cosmopolitan polyglot workforce that spurned not only ancillary companies to set up shop in Greenville but new tech ventures as well. This new growth led to the town being referred to as the Silicon Valley of the Southeast. The real coup, however, was when the town hired prominent landscape architect Lawrence Halprin to turn Main Street into a picture postcard row of shops and restaurants that would give the downtown a modern chic urban feel. 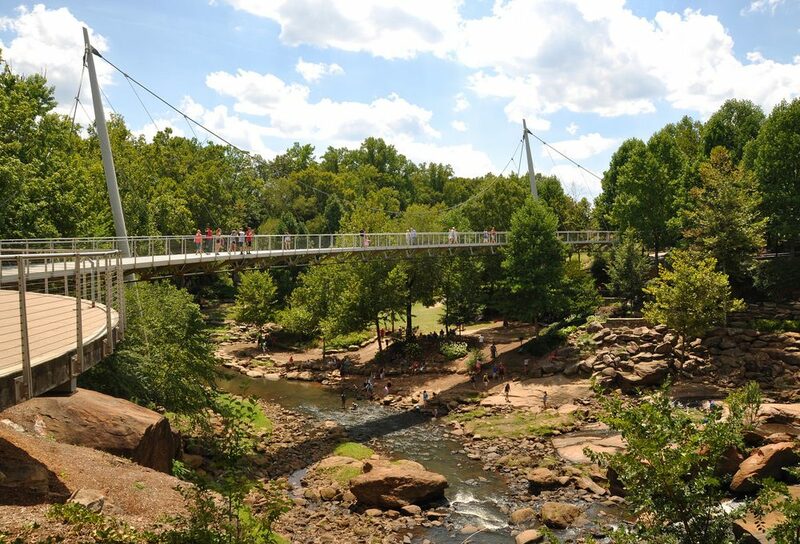 The next step came in the form of a four-lane bridge across the heavily polluted Reedy River being torn down and replaced with a futuristic looking 345-foot long suspension bridge for pedestrians only. While this was going on steps were taken to not only clean up the river, but create a lush park like setting complete with a 21-mile paved cycling trail along a disused railway track. Looking for a place to train during the winter, American cycling legend George Hincapie moved to Greenville to not only make use of its new bike path but to take advantage of the nearby mountains. 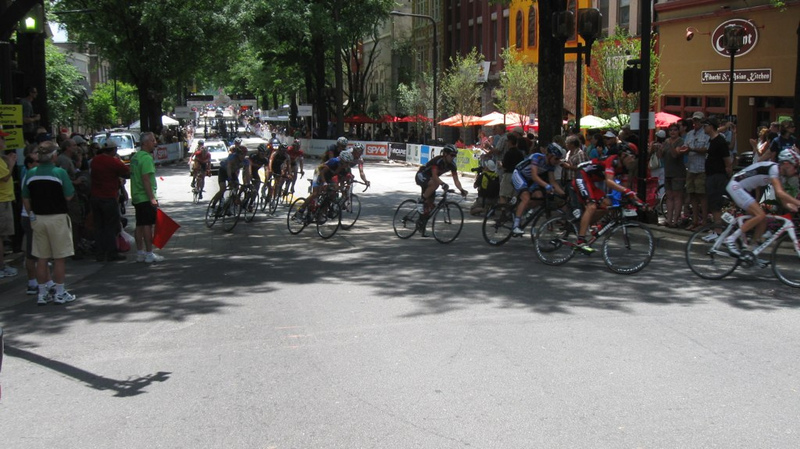 Other professional cyclists and their teams soon followed suit in relocating to South Carolina and with them came all the other accompaniments young urbanities liked to have on hand. Several microbreweries and coffee roasters sprang up, as did hip restaurants pioneered by talented young chefs looking to break out of the big city kitchens and make it on their own. Today Greenville is a thriving town with a median age of just 38 and with property half, the price of what you would have to pay in Boulder the town looks set to grow as more and more young people see Grenville as the perfect balance between work and play. Photos courtesy of James Willamor and Jason AG.